TELEVISION REVIEW: Merlin is a Fun, Fluffy, Summer Series. So far this Summer has been really sparse when it comes to new programming. There’s a lot of good stuff coming in the next few weeks, but it seems like instead of hitting us with new Summer programs all at once everything is being spread out. 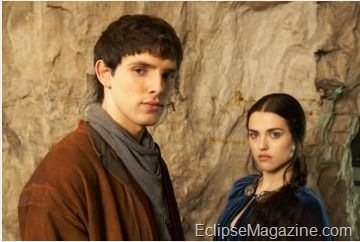 A few weeks ago we had Burn Notice, Royal Pains and I’m A Celebrity Get me Out of Here premiere, Sunday night we have the long awaited debut of NBC’s surprisingly "lavish" production of Merlin (Colin Morgan). The production features an interesting cast that includes Buffy’s Anthony Head as the magic fearing King Uther Pendragon.